Filumena Marturano is for actresses what Hamlet is for actors. It's the role any actress would like to play. 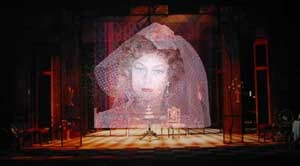 Written as a tribute to his sister, Titina, on the base a real anecdote, this play was cause of much concern for Eduardo De Filippo. The first night in Naples (1946) was unsuccessful. The rehearsal process painful. When Titina decided to follow her instinct and perform as she felt like, the success was so big that for many years afterwards she was called with her character's name, Filumena. The original performance was so well known that the Roman Catholic Pope, asked her unexpectedly to act one of her monologues during an official meeting. 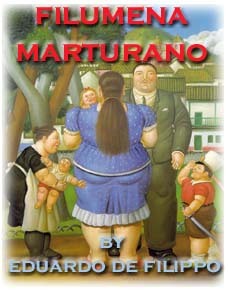 De Filippo directed a movie with the same title, a Tv version and consented the adaptation for the screen: Wedding Italian-Style, starring Sophia Loren and Marcello Mastroianni. Much of the success of this character is due to her ambiguity. A simple woman, illiterate, who wants to create a family for her children, or a ferine prostitute who exploits the situation? Myth of the motherhood, Filumena deals with instinct and aging people. 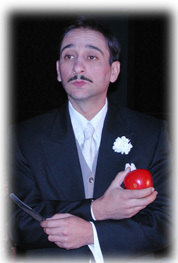 Eduardo, who played Domenico, depicted a selfish aged gigolo, who learns to become a man.